The yet unopened West Des Moines restaurant is facing online backlash for what some say is co-opting black culture and being insensitive to Asians. It hasn't even opened, but West Des Moines restaurant Me So Hungry has announced plans to instead operate as Eggs & Jam after an online uproar over its name. 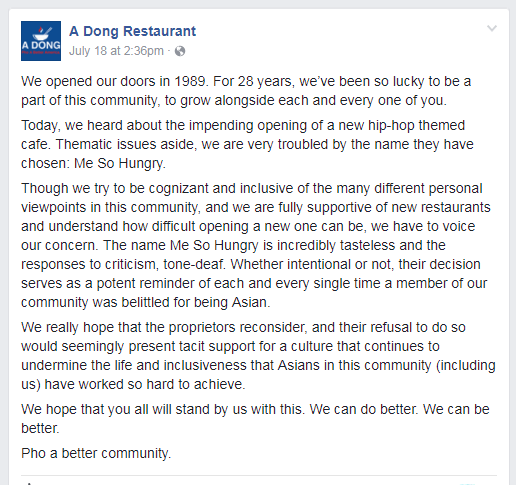 An article headlined “New White-Owned ‘Hip-Hop’ Restaurant Has Both Asian And Black People Outraged” posted Monday on the Huffington Post said the restaurant was facing online backlash for co-opting black culture and being insensitive to Asians. Sarah Cattoor and her husband Ryan Greening, who are opening the restaurant, said they were blindsided by the reaction to its name. "The name came only from a love of the 90s and we had no intention to be offensive to other cultures," they wrote in an email Wednesday. The couple, who are white, "simply wanted to appreciate good music and make amazing breakfast food," they wrote, apologizing to anyone that was offended. The Huffington Post article referenced an Iowa Informer article that reported on negative comments left on the restaurant's Facebook page. A Dong, a popular Asian restaurant in Des Moines, joined in the debate Tuesday. A Dong's post said it hoped Me So Hungry's owners would reconsider the name. Not doing so "would seemingly present tacit support for a culture that continues to undermine the life and inclusiveness that Asians in this community (including us) have worked so hard to achieve." "What if we took cultural appropriation and made it a family-style breakfast cafe?" Cattoor told the Register last week that the restaurant will have a '90s hip-hop theme and menu items like fried chicken and waffles, Dutch Baby puffed pancakes and breakfast poutine. “It’s going to be a really fun place and all the (1990s) music will be family friendly,” she said. Eggs & Jam is owned by Blue Monday Corp.
Cattoor and Greening also operate The Keg Stand and Cattoor's on Grand, both in West Des Moines. The name of their corporation is Butterface LLC. Butterface is a derogatory term to describe a woman with a desirable body but an unattractive face. Eggs & Jam apologized for its former name in a statement. "Our intent was to create buzz and interest tied to a popular ‘90s song," it read. "However, it is clear we did not understand how it would be perceived, and how it could offend people in our community. We look forward to opening in August and providing people with a fun eating environment built around the music of the 1990s." Eggs & Jam is scheduled to open Aug. 9 at 1907 E.P. True Parkway in West Des Moines. There are a handful of eateries named Me So Hungry from Austin and San Francisco to India and Saudi Arabia, as well as the similarly named Miso Hungry sushi bar in Santa Barbara, Calif.
— The Register's Patt Johnson contributed to this report. Jan. 25, 2017, 4:56 p.m.